Yeovil's FA Cup tie against Manchester United was billed as a meeting between the haves and the have nots of English football - and former Red Devils manager Sir Alex Ferguson certainly made an arrival to underline the differences in the two club's circumstances. 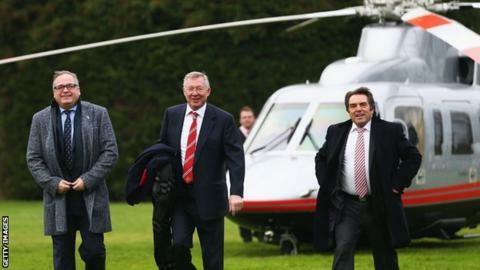 Forget hopping on the team bus, taking a chauffeur-driven car or catching the train - the 73-year-old Scot turned up for United's third-round tie by luxury helicopter. The 20-time English champions had never travelled to the League One strugglers, who were promoted to the Football League in 2003, for a competitive fixture before Sunday's tie. But, as our images below show, the 9,665-capacity Huish Park will have been something of a culture shock for Ferguson, United's players and travelling supporters.